In a flash, Maddie’s life is unrecognizable. No more stressing about college scholarships. Suddenly, she’s talking about renting a yacht. And being in the spotlight at school is fun…until rumors start flying, and random people ask her for loans. Now, Maddie isn’t sure who she can trust. 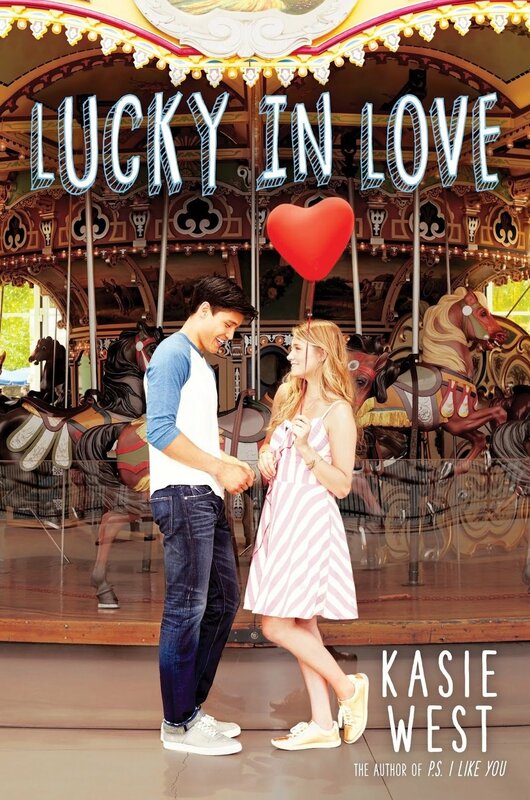 Lucky in Love is Kasie West’s latest contemporary romance to hit shelves. I’ve only read one of her previous novels (The Fill-In Boyfriend), and I was so happy to get the chance to read another one of her books! Lucky in Love begins with Maddie living her average life—studying with friends, working her part-time job at the zoo, and applying for college scholarships. After a terrible birthday filled with parental fighting, her best friends bailing on her without a word, and financial worries, Maddie decides to prove a point and buy a lottery ticket after the cashier goads her into doing so. What she never expects in a million years happens—she wins. I adored how kind and trusting Maddie was. She worried so much for her family, and it was refreshing to such a generous character. Even though I liked how trusting she was, there were definitely times where I wanted to sit Maddie down and talk with her. But that’s okay because we see her grow over the course of the story and that’s important. As for the romance, I loved her flirtationship with Seth. Seth was such a sweet guy, and I adored their little romance so much so that I wishing I could see them together even more. Now for a tiny bit of a spoiler: I loved that once Seth found out about the lottery win, he didn’t make a huge deal about it. Maddie needed a friend to be there for her and treat her as she was before she won. I was so glad that Seth understood this and didn’t get angry at Maddie for keeping it from him. Maddie was the one to walk away from him, and I appreciated that the plot avoided this unnecessary added drama on his part. Overall, Lucky in Love was more than a cute romance (although it was)–it was about learning to trust yourself. I recommend this for those looking for a sweet romance. Thanks, Zoe!! I really hope you enjoy it as much as I did when you get the chance to read it! Thanks! Have you read any other Kasie West books? I haven’t read any Kasie West books. This is such a cute cover. I think my daughter would enjoy it very much. I hope she enjoys it as much as I did!